Facilitates extension and flexion exercises. Isolate extension of all fingers and individual finger joints. 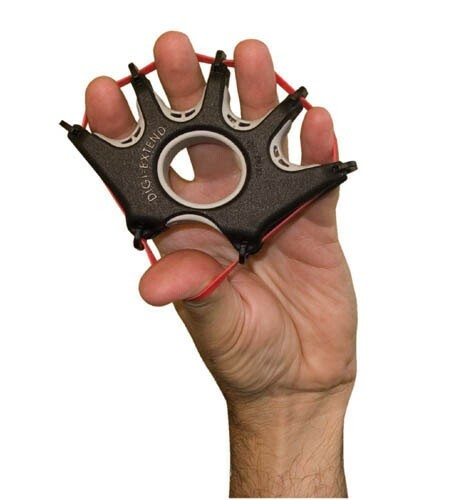 Develop isolated finger strength, flexibility and coordination. Vary resistance by changing to a different color-coded rubber band. 4 color-coded band resistance levels: Tan, Yellow, Red and Green allow each muscle or joint to work at a comfortable level and build as increased strength is achieved. For rehabilitation of carpal tunnel, stroke, fractures, tendon injury, nerve lacerations, tennis elbow and more. Exercise pamphlet included.